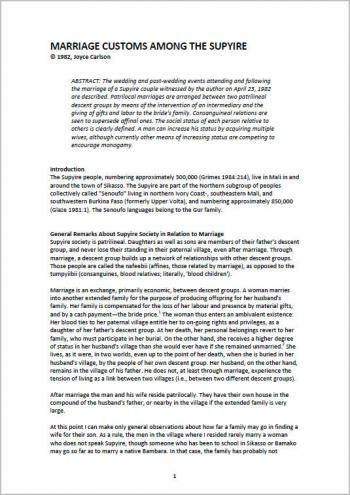 The wedding and post-wedding events attending and following the marriage of a Supyire couple witnessed by the author on April 23, 1982 are described. Patrilocal marriages are arranged between two patrilineal descent groups by means of the intervention of an intermediary and the giving of gifts and labor to the bride's family. Consanguineal relations are seen to supersede affinal ones. The social status of each person relative to others is clearly defined. A man can increase his status by acquiring multiple wives, although currently other means of increasing status are competing to encourage monogamy.